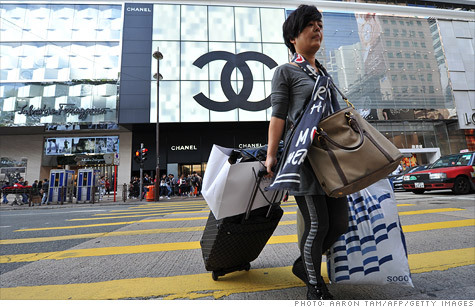 The middle class in China has topped more than 300 million people. And they are a growing factor in the world's economy. NEW YORK (CNNMoney) -- CNNMoney interviewed Helen Wang, author of The Chinese Dream: The Rise of the World's Largest Middle Class and What It Means to You. A consultant, Wang was raised in China and has lived in the United States for more than 20 years. They are a lot younger ... 20 to 50. A lot of them own homes. Like Westerners, they want everything Americans have. This new middle class just emerged in the last 15 to 20 years. Fifteen years ago, people didn't have cars yet. But in the last seven, eight, or nine years ... everyone has a car. Some people have more than one car. A. It is estimated that it's more than 300 million -- already larger than the entire population of the United States. About 25% of the population is middle class. It's about 50% of the urban population. A. A lot of it is entrepreneurship. With China's economy growing over the last 20 to 30 years, there have been a lot of business opportunities. The younger generation -- people under 30 -- they are consuming like crazy. They save zero. They spend all of their salary on a Louis Vuitton purse. A lot of them stay with their parents so they don't have housing expenses. But once they get married, then they start to save. A. They know China is growing wildly, and they're very busy trying to catch this opportunity. They know China won't grow at this high speed forever and they know the window of opportunity will close. They know government won't take care of them anymore. They have to take care of themselves. A. The Chinese middle class may grow to 700 to 800 million, which is 50% to 60% of China's entire population. In the past, all the predictions have proven to be too conservative. But on the other hand, a lot of Chinese will be in the lower middle class because education will prevent them from moving up. If young people start going into vocational schools, that's for lower skilled jobs. A. If you are born in urban China, you can go to public school and you enjoy a lot of government benefits. For rural Chinese, they have none of these. If you're born in the rural area, you can't even live in the cities. That's gradually changing. They let the rural people come into the cities to do the work. But there are still restrictions.